A nice dry day and very mild, overcast at the start but it got very bright from lunchtime onwards with very little and often no wind, not ideal conditions but no one was complaining after the recent snow etc…! The section sections were split into 5 man sections today so everyone had a chance to win a few ££s, and with £400 in the Golden peg fund and 3 golden pegs drawn there was plenty to fish for. Section 1 on Wallace saw Brian Docherty drawn on end peg 32, but with pegs 33 & 34 in we’d hoped it would help share the carp around… Not so..! 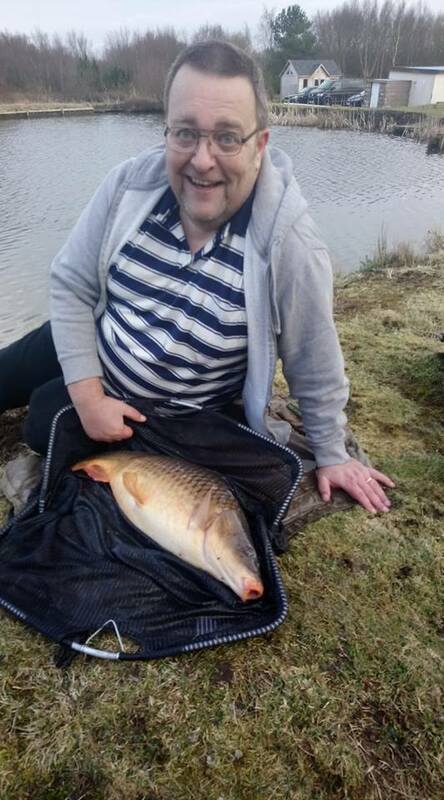 Brian Docherty was the runaway winner with a lovely net of carp including one beautiful Common carp of 15lbs 8oz… His total winning weight was 58lbs 11oz which not only seen him win the section but the overall match… Well done Brian..! Section 2 on the middle pegs was a tighter but slower affair, with most of the fish caught in a 45-minute spell around lunchtime. 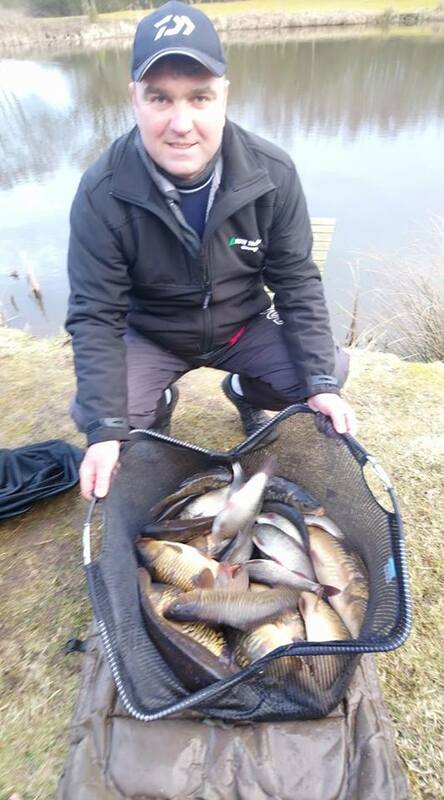 Don Lines won the section with 10lbs 11oz which included 3 bonus skimmers on the tip rod/cage feeder which tipped the balance in his favour with the rest catching a few small ide. 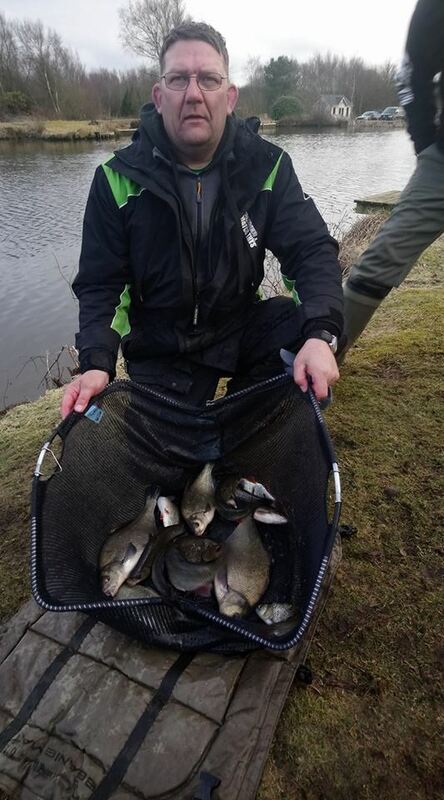 Section 3 saw Rosen Arsov win comfortably with 40lbs 10oz… Most of which were carp caught in his left-hand margin…! A good effort..! 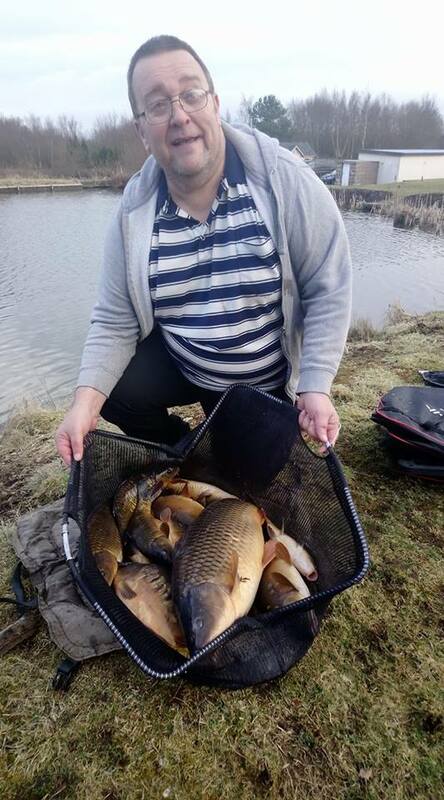 On Queensberry Water, section 1 was won by Mark Lyons with 19lb 6oz…. 4 big bonus ide caught in a brief spell of activity on his pole line helping him at the weigh-in. 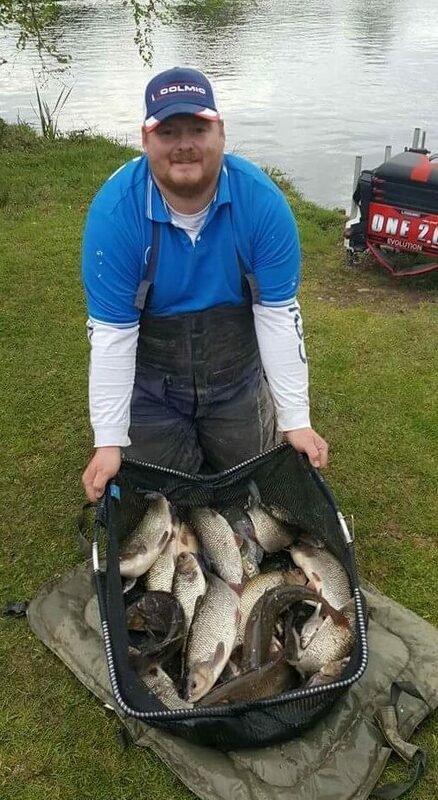 Section 2 was won by Matthew Waugh with 15lb 12oz of silvers caught on the pole. Very few carp and big skimmers were caught on Queensberry Water, surprisingly, considering how well it fished during the week. Everyone had bites and caught fish including the two DNWs, so an improvement on last week…! Many thanks to all who made the effort to attend the match, a decent turnout for the first big match of the year.